A very large crowd at Ford Canyon took on the clouds and threatening rain on May 7, with sunshine being the ultimate reward as the Miyamura Patriot girls’ team shut out Los Alamos in the opening round of the State Tournament, 11-0. 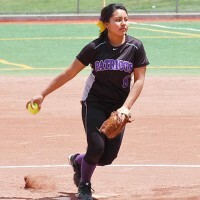 NAVAJO, N.M. – Nabahitachiini Nez, a student athlete at Navajo Pine High School, is the latest area athlete to be accepted to play at the Down Under Sports Tournament in Australia. The annual tournament takes place over the summer and includes student athletes from all over the world. A graduating senior, Nez, 17, was a standout defensive tackle for the Warriors for four years. He played offensive when necessary, but Nez anchored a Warriors team which was at times short-handed and overmatched. Despite a challenging season as a wrestler for Miyamura High School, Bennie Baca was chosen to go to Australia to participate in that country’s Down Under Sports Wrestling Tournament. Besides the United States, the annual tournament consists of wrestlers from as far away as New Zealand, Hawaii and American Samoa. The tournament takes place from July 10 through July 18 and Baca said he wants to concentrate on fundraising in the interim since Miyamura High School is not connected to the trip. Joseph Olivas likes being in a corner. It’s a space where re-engineering and re-evaluating are paramount. During a minute between rounds, he gets to relay a lifetime of advice. Sometimes his words are simple: Lead with your left and keep your chin down and hands up and keep moving. Olivas, 46, volunteers a few hours an evening to train up-and-coming amateur boxers at the nonprofit Lites Out gymnasium on Gallup’s tough north side. It’s another rough start for the Gallup Amateur Baseball/Softball Association, which directs and organizes the recreational, yet competitive, baseball and softball teams and leagues for the upcoming summer months. The president of the association, Kevin Menapace, was forced to resign after some parents insisted on appearing at his place of employment to complain about a variety of small items they didn’t like. These were most likely the same parents who refused to attend any of the meetings where these decisions were discussed and agreed to, and probably in the same social grouping as those parents from last year that used the same tactics.